Faux plants are God’s gift to the non-green-thumbs of the world. And faux trees are getting more and more realistic looking which is good news for me because I believe every room needs a plant, a tree or two….but somehow “Water-plants-Wednesday” escapes me. That being said – when faux trees arrive, usually they come in a smaller weighted pot – that are both hideous and helpful. That small pot can fit into most baskets, pots and planters. And so today I am sharing how to pot those faux trees and make them look photoshoot worthy. Here is the faux olive tree that I got last year and never finished potting. See how tiny that base is compared to the top? Some bases are smaller than others. I find that the smaller bases can do a great job of weighting the tree down and some do not. Usually when I spread out the branches, I find that the trees with a large ‘spread’ of branches get off balance more easily. In this case, the olive tree was off slightly and would tip if shifted so I wanted to add a bit more weight. 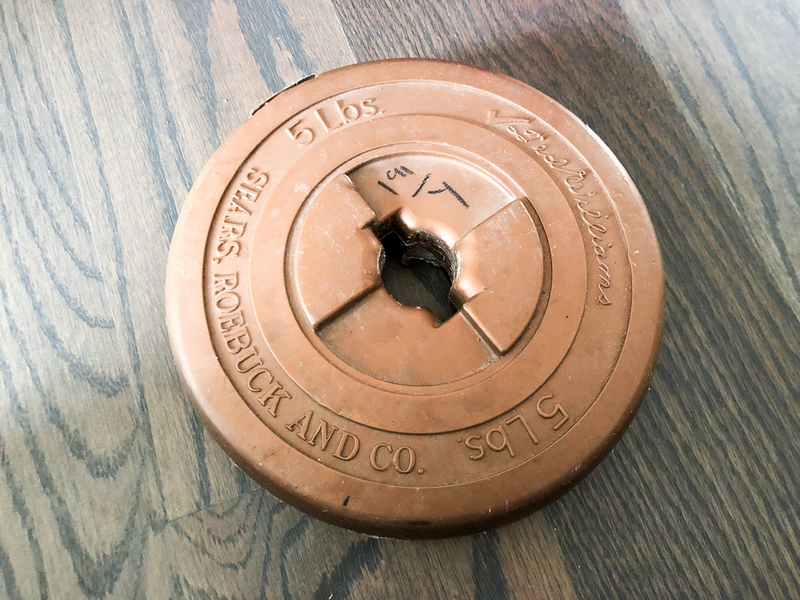 Goodwill and other thrift stores usually have plenty of weights that are old, cracked and super cheap. 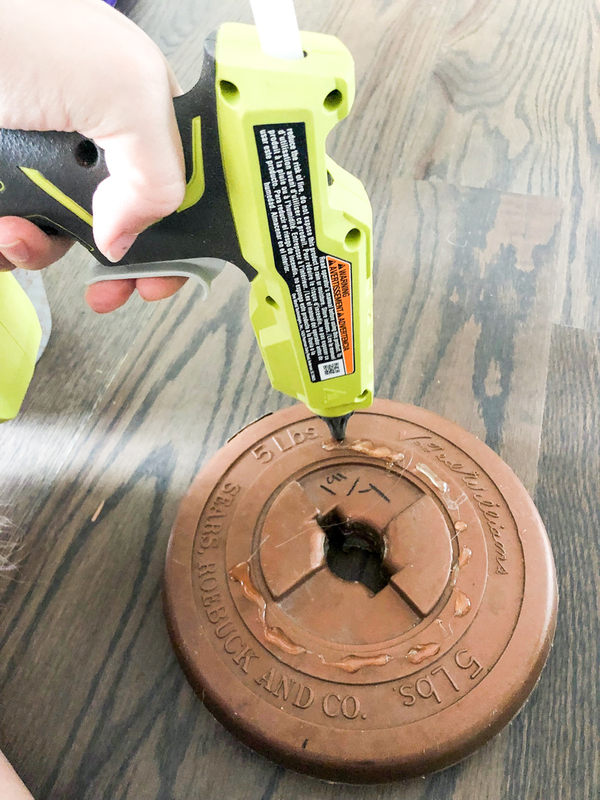 I found a round weight for this project for $1.91. I also found some hand weights for any future potting project I may need to have weighted down. The weight isn’t absolutely needed but I like adding it because my kids end up throwing socks and balls and random stuffed animals so nothing is safe. You will also need other items…. A basket or planter or large pot is needed. I think it looks best when the width of the basket is at least half as wide as the tree OR more than 1/4 the height of the tree. 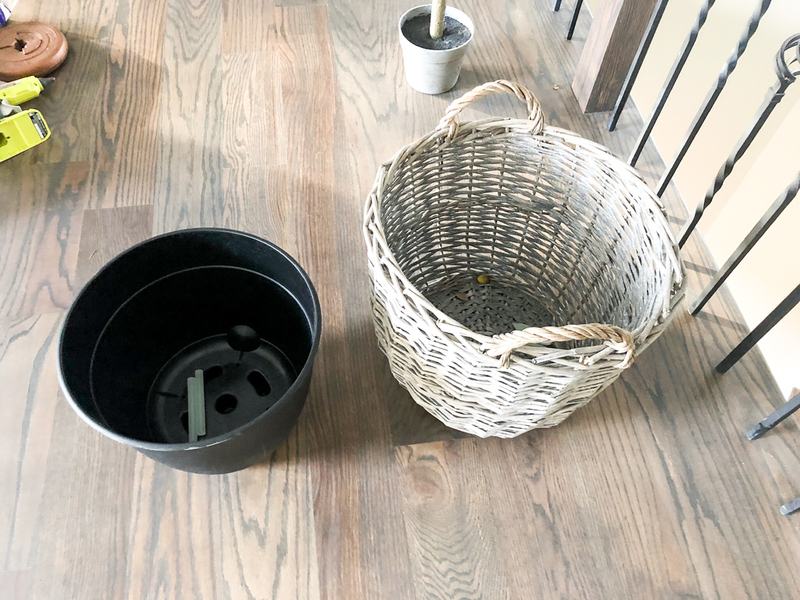 I described how I pick the size of the basket or planter here…. 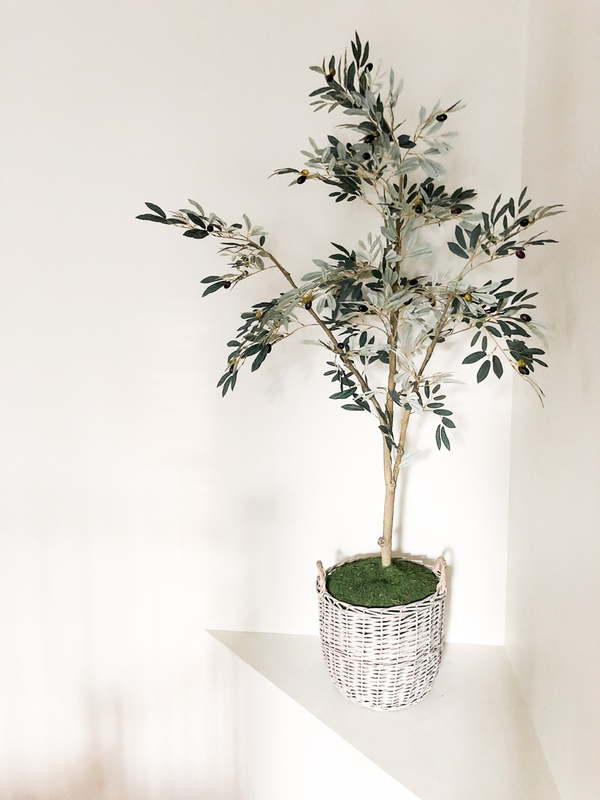 Once you pick your planter or basket, it’s time to make that tree look like it naturally grew there…because obviously a faux tree naturally grew right there in the living room in a basket 🙂 I use a whole bunch of plastic bags (bubble wrap, paper, or cardboard will do), a pair of scissors, a glue gun, and some flat moss. Make sure the weight fits in the bottom of your pot first. If it does fit, grab your glue gun and put a whole bunch of hot glue on the face of it. Then stick your pot to the glue and allow that to dry. This heavier weighted tree is going to make it not top heavy but we also need to make sure that it doesn’t tilt inside the pot. Oh did I mention? You need to put the weighted plant inside the black pot and then inside the basket. I smashed most of the plastic bags around the little pot and bigger pot. I didn’t have any black plastic bags otherwise I would have used those on the outside of the black pot. I cover even the original tree pot with plastic bags. You want the slope to be from the tree trunk down to the outside. Next we are gonna put the moss on top of everything. I bought my sheet moss at Hobby Lobby (use that 40% off coupon!) and it is cut easily with scissors. You want to cut it so that it covers the entire top of the basket with a small overlap. Then cut a wavy line into the center. In the very center I cut an X shape. Slide the tree trunk into that X and then lay the moss flat around the top of the basket. The wavy line you can overlap. Mine needed a bit more stuffing so I added even more plastic bags under the moss. Once it looked fuller, it was time to get that seam flat and flush. I peeled off the paper backing near the seam so that it looked even more natural. Then I put hot glue right at the edge so that it could stay put. After that I tuck the edges around the sides and slide it in between the basket and the plastic bags. And that is how I pot my faux trees to make them look natural and grounded in any planter or pot! And the best part?! I can’t kill it and it will continue to look good year after year! 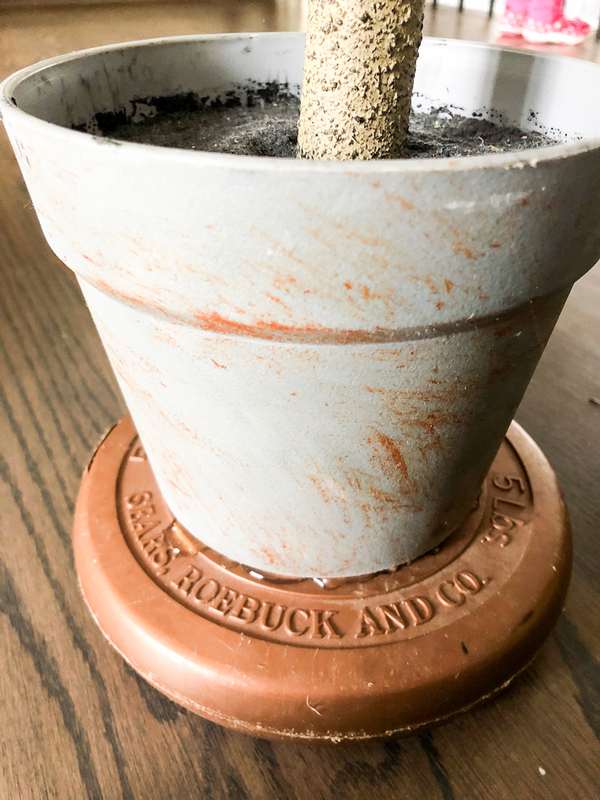 That being said – here is the link to the moss I used and some really nice affordable basket finds and other large faux plants that are GREAT. I linked the olive tree below that I used in this tutorial and I own both fig trees that I linked below. Can not recommend them enough and I can’t wait to show you more ways to use faux plants in your home!